I know, I know, this is post is way too late. But you know what they say, better late than never, right? Well, today I will be sharing with you all my experience at TO Food Fest this year. I have to apologize for the lack of photos in this post, in my defense, during that food fest weekend, our house had no Internet connection (I know, unthinkable, I barely survived), I totally missed the confirmation e-mail for my media pass. (Tears streaming down my face) Without the pass, I had to go with thousands of other people, so I decided not to bring my giant DSLR and just go and enjoy some food. I only managed to snap 4, so feel free to use your imaginations. TO Food Fest is an annual food festival here in Toronto, more specifically, Scarborough. This is my first year attending and my overall experience was positive. There were lots of vendors selling all kinds of unique items. I tried the BBQ squid, Japanese fried chicken, rice balls, pierogi, empanada, bubble cake, Hawaiian BBQ skewers, and baos with meat inside thingie (sorry forgot what they’re called). I know, way too much food, took me days to recover, but it was totally worth it. Let’s start with my favorite - the bubble cake. For someone who is so passionate about dessert, you would be surprised to hear that it was my first time trying this Hong Kong style dessert. It had the perfect soft texture, paired with your simple vanilla ice-cream, it was beautiful! Next on the top of my list is the Japanese fried chicken. I am usually not a huge fan of fried chicken, I eat them once or twice per year, max. But this totally changed my opinion, The meat was tender and juicy, with the crispy layer around it, perfection! I really enjoyed the sweet chili sauce as well. Fried rice balls are absolutely amazing as well. I took a bite of both the chicken and pork one, as always, I preferred the chicken one way better. It had pineapple on top, the perfect balance between sweet and salty. 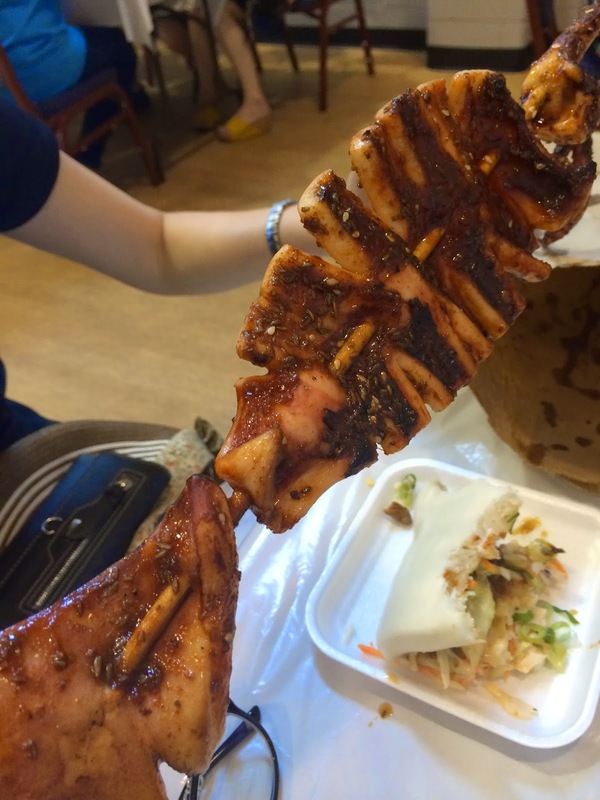 There was a couple items that I felt quite neutral about, which included the BBQ squid (my mom loved it, but it was ehh for me), pierogi (I enjoyed it, but it wasn’t crazily amazing), Hawaiian BBQ skewers (only took one bite, again, nothing special). 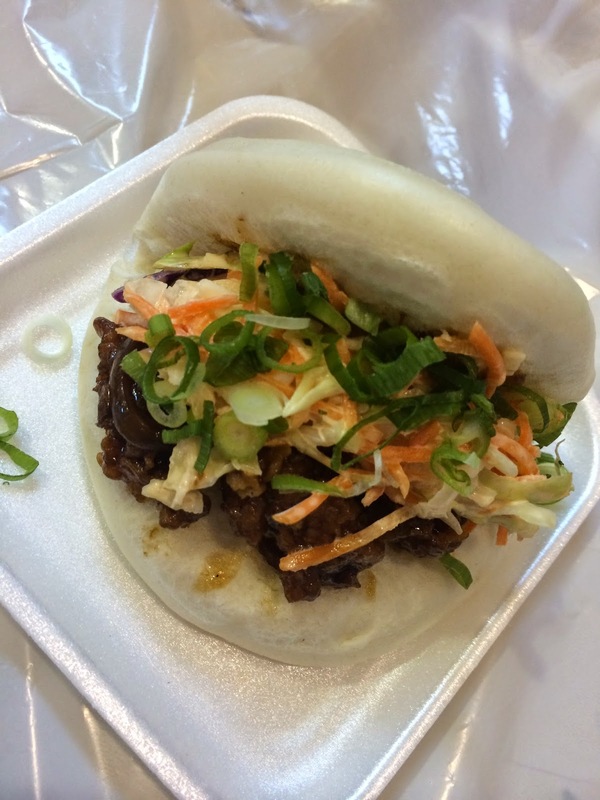 I did quite like the bao thingie, although I found the bao itself was slightly too dry, it didn’t taste very fresh. And there was one total fail item, the veggie empanada. I thought, hey I had too much meat already, let’s trying some veggie options. Mind me, it was my first time trying empanada as well, unfortunately, it was horrible! There were only beans inside, nothing else. The beans were extremely dry, and bland, the pastry outside was again, quite tasteless, overall, I had to toss it out because it was that bad. Maybe it’s just me, but this item was really disappointing. The experience was lovely, although I do wish there were more seats available. But I guess that’s part of the food festival experience. Also, I wish there were more dessert options, there weren’t many unique items to satisfy my sweet tooth. Overall, I had a lovely time at the food fest, and if I get to go next year, I would for sure make good use of my media pass and snap loads of photos. Have you ever gone to any food festival near where you live? If you have, did you enjoy it?